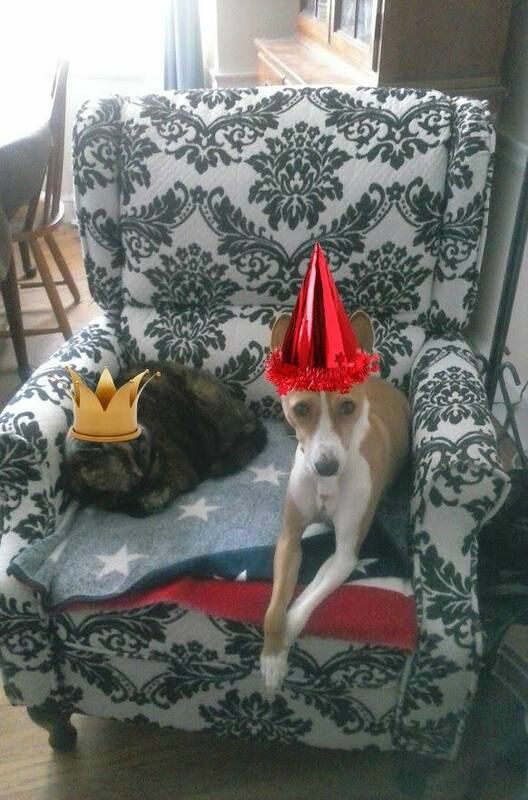 Our Party Animals , Moxie and DJ, "dressed" to greet the New Year. Since my last post about direct ancestors and deciding where to put my time, energy and money for genealogical research in 2016, I've spent my genealogy time thinking about just that. Part of me does not want to choose which ancestors to research. 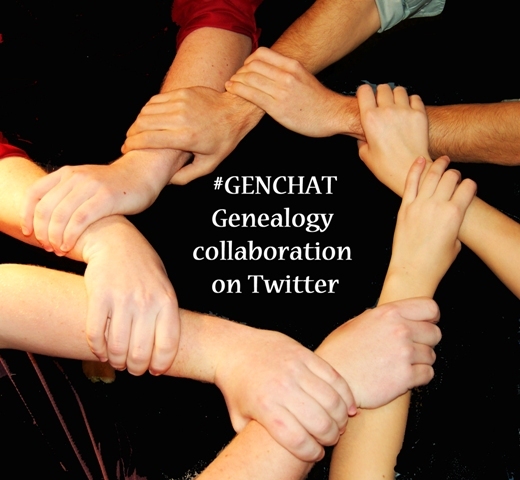 Like most, if not all, genealogists, my ancestors are very real to me. Some because I knew them in life, the rest I guess because they're my people. I don't want to pick and choose which ones I will research because I feel a little bit like I'm saying, "No" to the rest, like I'm ignoring them. Is that a little bit nuts? Possibly. And I'm ok with that. As I said in my last post though, time, energy and money are finite, so I have chosen a couple of lines to research this year with the goal of extending them as far back as possible and I have chosen some other research and preservation goals for this year as well. When I asked myself whether I wanted to concentrate on finding direct ancestors this year, or enhancing my knowledge of ancestors and relatives who are already identified, my answer was, "Both, obviously!" So here are my goals for this year. 1. To complete the 12-month Genealogy Do-Over. I participated in the 2nd cycle of the 13-week Do-Over last year. It was a tremendous help in my research but I didn't complete 100% of the program for various reasons, most of which were time related. I think that having a year this time around will allow me to work around my other commitments and deal with things that come up along the way. 2. Learn more about researching English records. Among the lines I have chosen to research this year are the ancestors of my paternal great-grandfather, Arthur William Matthews. In order to do this, I need to learn all I can about researching English church and other records. 3. Extend the lines of Arthur William Matthews at least two generations. I have chosen these lines because I already have some leads. I am very curious to see if I can prove the information I already have and how far back I can take it. 4. Learn more about researching Swedish records. Some other lines I have chosen to research are the ancestors of my Swedish great-grandparents. In order to do this, I will need to learn more about researching in Sweden, although I already have some basic knowledge and belong to a couple of Facebook groups where I can get some additional help. 5. Extend the lines of Carl Johan Anderson. Some kind people in a Facebook group have given me some assistance with this, but once I have the tools, I'll take his lines as far back as possible. 6. Extend the lines of Mathilda Alfina Johanson. I have an extensive genealogy for my great-grandmother's family and ancestors but it is written in Swedish and was completed in the 1960s. Documentation is referred to but not provided. 7. Continue with my Manchester, CT research. Carl Johan Anderson, Mathilda Alfina Johanson and some of her siblings settled in Manchester, CT. I have done a fair amount of research there but there are some more vital records I would like to see and, now that they are available online, I would also like to see what I can learn from the payroll records of the mill where my great-grandfather spent his career. I'd also like to stay overnight on a Saturday and attend church services at the Anderson family church there. 8. Archive and record vital facts from the documentation found in the basement stash. If you don't already know, I was blessed to find boxes of photos, books, negatives and ephemera in my step-mother's basement this year. I have done a preliminary sort for storage, but I haven't recorded any of the information in any meaningful way yet. I also need to purchase some specialized archival supplies for this project. That will depend on my budget. 9. Scan, label and archive all loose photos. Again, I have done a preliminary sort, but still need to scan many of these photos, label them and purchase some additional supplies. 10. Finish scanning Dad's slides. This project is seemingly without end. Except that it WILL end in 2016! I hope I am not biting off more than I can chew, but I think that if I can keep myself focused on my goals, and not allow myself to be distracted by those Bright Shiny Objects, I should be able to complete my list. I'm more excited than ever to get going again. Thank goodness the weekend is almost here! I am impressed that you actually wrote down your goals. Similar thoughts run through my head about lines to research or types of research to learn more about, but I never write them down. I should -- it would help me be more focused. Like you, I can't decide to research just this ancestor or that because I never know when serendipity will strike in the form of a new lead or an email from a new cousin.